ADVANCE REGISTRATION IS NOW CLOSED. PLEASE REGISTER AT THE DOOR. Complimentary wine and refreshments included. 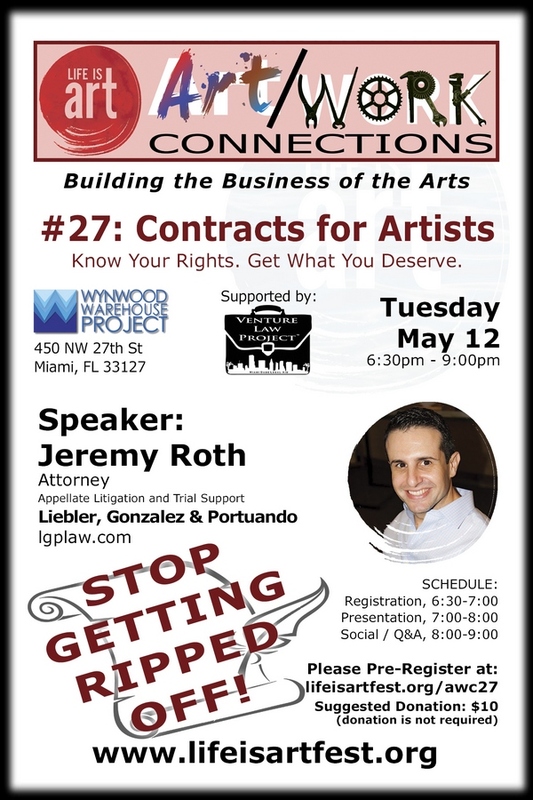 Supported in part by the Venture Law Project of Dade Legal Aid and Volunteer Lawyers for the Arts with the Put Something Back Program. How many times have you been ripped off because you did not have or did not understand a contract? Plenty, right? This seminar will help you understand what you need in your contracts and how to understand them. We will break it down and make it easy for everyone to understand. In addition, we will be making an introduction to the Volunteer Lawyers for the Art. The program provides pro bono legal assistance through volunteer attorneys on specific client requests for the Miami-Dade region. This is a program that you really need to know about. Mr. Roth is an Associate of the Firm and a member of the Appellate Litigation and Trial Support Department. Mr. Roth joined the Firm in 2013. Prior to joining the Firm Mr. Roth practiced appellate and commercial litigation at a large law firm in Miami, and briefly worked as in-house counsel for a startup company. During law school, Mr. Roth served on the Emory Moot Court Board. As a second year student he competed in the American Bar Association Law Student Divisions National Appellate Advocacy Competition (NAAC), winning the Boston Regional and placing in the top 16 at the competitionâ€™s national round. His international experience includes a summer program in London, England at the London School of Economics; a legal internship in Geneva, Switzerland at the World Health Organization; and field work in the Andean foothills of northwest Argentina, where he completed a law and anthropology project concerning the indigenous peoples of the region. Wynwood Warehouse Project is a 7000 square foot space dedicated to promoting and facilitating the development of Contemporary Artists. Today, Danilo Gonzalez has developed The Art Place Wynwood as a Contemporary Art Gallery and as an artist in residence program with artists Giles Neale, Alberto Haubold, David Tupper, Molly Bo, Emilio Adan Martinez. Since The Art Place Wynwood arrived to Miami four years ago it has been heralded as one of the most active galleries in Wynwood. Our intention is to preserve the essence of our Wynwood Artist community that is slowly being replaced by commercial developments. Wynwood Warehouse Project is offering to the community a Contemporary Art Gallery, workshops, community and private events, art collection consulting, professional artist representation, and affordable meals at the Wynwood Cafe. Venture Law Project is an in-house program of Dade Legal Aid (DLA); they also have family law, domestic violence, landlord tenant, child advocacy and custody, guardianship, bankruptcy – all in house attorneys at Dade Legal Aid (123 NW 1st Avenue). The Put Something Back program is a separate program run administratively out of DLA’s office that is a referral system for private attorneys that want to give back and take on pro bono cases that DLA has interviewed and verified they are qualifying financially inaccessible persons. The Volunteer Lawyers for the Arts is one of the areas Put Something Back refers attorneys through, in addition to hundreds of other areas we don’t handle in house. The Art/Work Connections program is a series of of professional development seminars held at galleries and art spaces around South Florida targeted at artists and those working in the arts featuring experts speaking on a variety of topics vital to the success of working artists. Everyone is welcome and can benefit from them. Business professionals are brought in to cover a wide variety of topics including health care, financial planning, contract negotiation, copyright law, portfolio development, social media, marketing and much more. Life Is Art is a Florida-based 501(c)3 non-profit corporation dedicated to creating positive change in the community with the arts and culture through events and education. We give South Florida artists and civic leaders the tools to thrive and grow, while enhancing the lives of those living in our area. Having just celebrated its six year anniversary, Life Is Art is poised to continue being one of the few true advocates for the local arts and artists.